An all-star cast featuring Anna Netrebko, Bryn Terfel and Anna Prohaska, delivers a sensational new recording of Mozart’s Don Giovanni, conducted by Daniel Barenboim at the start of his inaugural season as Music Director of La Scala. It features stunning performances from Anna Netrebko as Donna Anna in her La Scala debut, Peter Mattei as a swaggering Don Giovanni, Bryn Terfel as his sidekick Leporello and Anna Prohaska as Zerlina. Anna Netrebko made her international breakthrough at the 2002 Salzburg Festival as Donna Anna, among the most powerful and moving of all soprano roles. Director Robert Carsen’s staging of Don Giovanni opens by turning a distorting mirror on the performers, the audience and the theatre itself, in what the Observer called “a fabulous visual coup”. 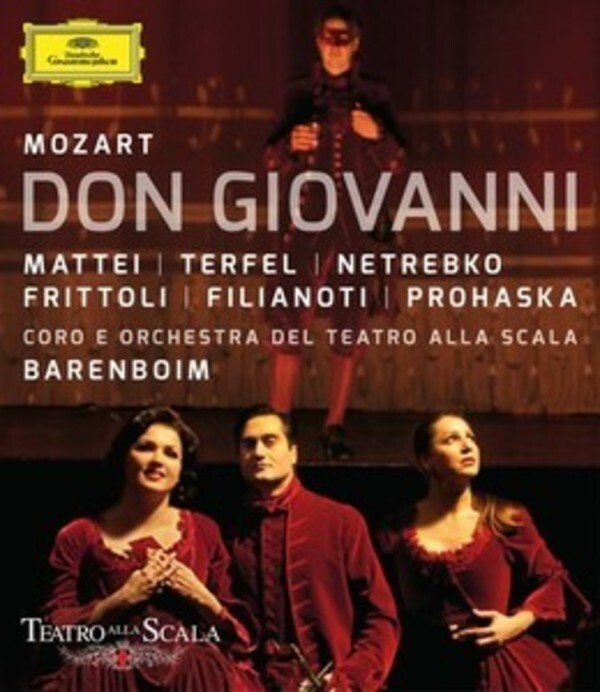 Recorded live at the Teatro alla Scala, Milan, at the opening of the 2011-12 season.